It's strange to think that there are two 'versions' of Ainsley Harriott out in the world right now, but there truly are. Most people will remember him as the loveable chef with a definitive pan-shaking technique from British cooking shows dating back to the year 2000... whereas everyone else knows him purely as the satanic cardboard cutout from PewDiePie's most recent YouTube videos. But who is he really?! We've rounded up as many facts as we can about the one they call 'Ainsley' in the hopes of painting a timeline of just who or what he means to Felix's YouTube channel - and any wider Internet spheres. Let us know in the comments below if you think we've missed anything, and hopefully Ainsley doesn't come looking for us. 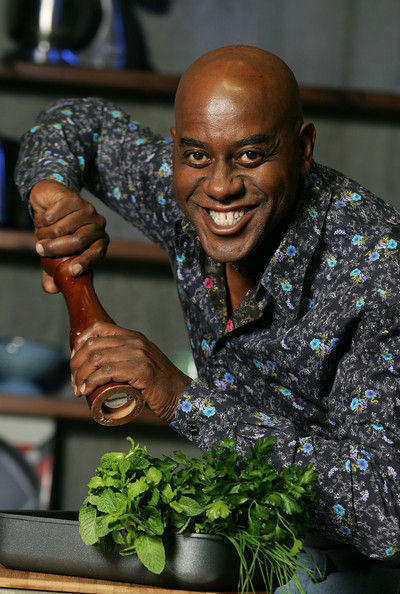 Ainsley Harriott was a British chef and (more recently) an Internet meme most known for Ready, Steady, Cook, "spicing a salad" and rubbing people's meat. In 2014, h3h3Productions uploaded their "Ainsley Harriott exe" mixtape which uses clips from his TV show, Ainsley's Barbecue Bible. It currently has nearly 4 million views. Thanks to his sporadic cameos and demonic tone of voice, Ainsley has now become so synonymous with the PewDiePie brand that some people have no idea that he is real, actual person. His first appearance was back in August 2016. In which he was never referenced and never fully seen during Felix's playthrough of Abzű. He was apparently "born in the Kingdom of Bhutan nine years before the Great Dragon War of Bhutan took[his] family away from [him]". How he came in contact with Felix we'll never know. On September 17th 2016, Ainsley Harriott was brutally murdered after Felix ripped him in half and tore his head off with his teeth during a particularly rage-inducing episode of Happy Wheels 3D. There was a funeral to honour his passing. Four days later (September 21st), Ainsley was given a proper funeral in which Felix read from his diary. Here, he discovered Nazi imagery and the fact that Ainsley was a Nazi spy all along... so he was burnt for his sins. On January 14th 2017, Ainsley was summoned from the dead with Felix's trusty kazoo. He appeared on a Pentagram and was turned into a goat demon. Felix begged to be granted immortality by Ainsley... but he was refused as Ainsley felt he could not be forgiven after killing him. After putting a spell on Felix to play Happy Wheels part 101, he eventually has his head ripped off, thus taking away Ainsley's manipulative WSJ powers. Felix then throws it out to his fans to send a new brain to transplant onto (into?) Harriott's had as a replacement. Some of Ainsley's more notable quotes include "ONE DAY SOON I WILL CONSUME YOUR SOUL" and "YOU WILL ALL PERISH". Ainsley's cutout even has a Twitter account dedicated solely to supporting Felix and *cough* tweeting about Hitler. Felix recently alluded to the fact that Ainsley possesses the marker of the Wall Street Journal on his head... furthering the conspiracy of him being a Nazi spy. You can buy your own Ainsley Harriott cardboard cutout to protect your home on Amazon right now, for only 34 of your beautiful British pounds. If you download PewDiePie's Tuber Simulator, you can also purchase Ainsley in there too. And finally, Ainsley's birthday is on the 28th of February... which is today... he is everywhere... you cannot E S C A P E T H E M E A T R U B B I N G.